Elizabeth Smart is a direct descendant of Mayflower passenger Degory Priest and Magna Carta Surety Robert de Ros. She has deep Mormon roots that include a connection to Mormon Church President Brigham Young. U.S. Presidential kin in Elizabeth Smart’s family tree include James Madison, Millard Fillmore, Zachary Taylor, Ulysses S. Grant, William H. Taft, Calvin Coolidge, Franklin D. Roosevelt, Rutherford B. Hayes, Gerald Ford, Barack Obama, and both Presidents Bush. 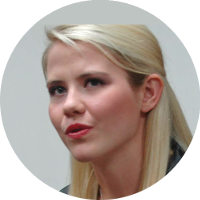 Elizabeth Smart’s celebrity kin include Vincent Price, David Hyde Pierce, Christopher Lloyd, John Ritter, Walt Disney, Zac Efron, Paget Brewster, Amy Grant, Anna Gunn, Jordana Brewster, Bing Crosby, Bill Nye the Science Guy, and Humphrey Bogart. Other notable kin include Declaration of Independence signer John Hancock, women’s rights advocate Susan B. Anthony, author and poet Henry David Thoreau, American Red Cross founder Clara Barton, U.S. First Lady Barbara Bush, and the legendary Johnny Appleseed (aka John Chapman).